In response to Trump’s faux populism and his misguided attacks on globalization, it has become fashionable in some circles to dismiss persistent US trade deficits as a problem (here’s Dean Baker and I on why this is wrong). The picture below comes to mind when I hear people try make this case. 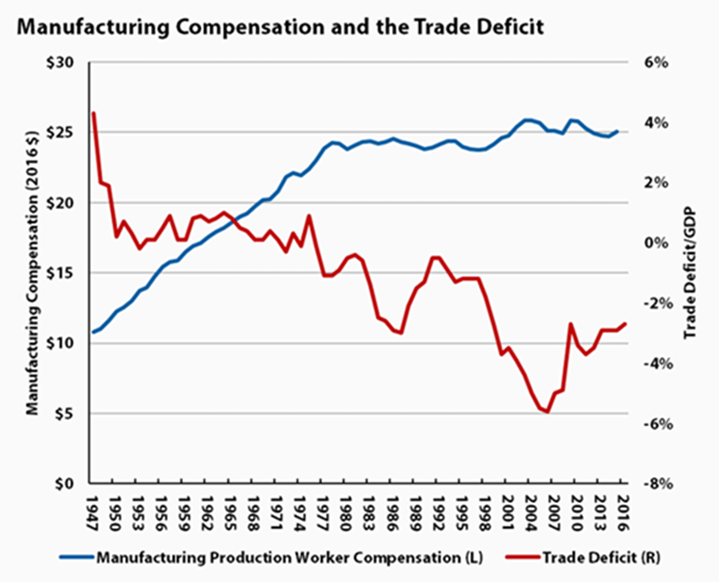 It shows the real compensation–wages plus benefits–for blue-collar workers in manufacturing from the late 1940s-2016 along with the trade deficit as a share of GDP. Basically, the real compensation of these blue-collar factory workers doubled from the late 1940s to the late 1970s. It has been essentially flat since then. I’m not at all claiming that the negative trade balances over the stagnation period fully explains this trend. There were and are many moving parts. But the usual argument by those who want to dismiss any negative impact of the trade deficit is that productivity growth, not trade, was displacing manufacturing workers over this period. But that doesn’t work on wages (nor does it fully explain the job-loss story, especially in the 2000s). Manufacturing productivity has been growing over this full period, including when real comp was rising. And while I don’t expect within-industry correlations between pay and productivity, I don’t see how rising productivity explains stagnant earnings. Demand shifts against non-college educated workers, deunionization, eroding labor standards, the absence of full employment, excessive profits in finance–I’m sure they’re all in the mix here. As is the trade deficit, as US blue collar workers in the factory sector went into global competition with much cheaper workers from the countries with whom we increasingly buy more from than we sell to. Share the post "Trade deficits and real blue-collar manufacturing compensation"
8 comments in reply to "Trade deficits and real blue-collar manufacturing compensation"
Very interesting. I’ll take a look. Greatly educational Atlantic article on the trade deficit (I understood most of it). seemingly forever lost (! ), is that most all today’s $10/hr US jobs (e.g., Walmart cashier) could plausibly be paying more like $20/hr — WITH GERMAN LEVEL UNION DENSITY. Given that 45% of today’s US workforce is earning $15/hr or less this seems to make debating about a few percent more or fewer manufacturing jobs blamed on this or that far from the defining issue of our time. And don’t forget health care looks like our next manufacturing — evenly spread everywhere and eventually government funded. Trade driven by offshoring has caused a large loss in manufacturing jobs. A change in trade policy can return many manufacturing jobs to the USA and stop many additional losses. However, Trump is fighting trade with a weak and incorrect argument that has no legal justification. Putting taxes on all imports is wrong. The right legal argument recognizes that trade policy and economics don’t account for THE THEFT OF PUBLIC INTANGIBLE CAPITAL (PIC) IN OFFSHORING where the PIC was financed with public investments. Failed trade policy is based on a paradigm of comparative advantage but doesn’t penalize offshoring that is advantaged by the theft of PIC. Economics currently ignores the theft of PIC by a company that does offshoring where the PIC is a product of public investments such as those in national defense, federal R&D, domestic security, healthcare, public (and non-profit) education and infrastructure. Trade policy currently protects the theft of many types of private IC such as patents but ignores the theft of public IC (PIC). The theft of PIC occurs when business operations at a company with jobs and factories are first established in America with PIC created as a result of public investments in IC that get translated into business IC and then moved offshore as proven business capabilities (both tangible and intangible capital) consisting of knowledge, tools, technology and processes. Since 1992, IC has been a larger part of business investments as a part of GDP in America than tangible capital. Theft of PIC in offshoring creates a negative externality in economics that is similar to pollution (and theft) of public resources penalized in environmental regulation. Trade imbalances don’t measure the flows of IC. Measuring the flows of IC created with public investments is a prerequisite for properly governing offshoring in globalization. The new international activity in Integrated Reporting is changing financial reporting in business to measure both tangible capital and IC. The 21st Century hopefully will finally see the huge gap in economics filled so capitalism, financial accounting and government policy measures IC and defines laws and compensation protecting applications of IC including private and public IC. The stagnation in wages is a symptom of the failure to compensate workers for the applications of their IC. Regulations on offshoring should require repayment of the apportioned public investments that produced the PIC used to build manufacturing operations at a company with a tax of at least 20% on the value of traded goods sent back to America from offshored factories. But there should be no broad tax on imports. Here’s a reference on how measurement and management of intangible capital changes the economics of financialization. The next innovation in economics and trade policy should measure and manage public intangible capital (PIC) and the flows of PIC as public property created with public investments. Trade, income inequality, globalization, automation. It reminds me of the old tale of a group of blind men all examining an elephant by feel and each describing what he thought an elephant looked like. It’s all the same elephant. Wages plus benefits actually stacks the deck against seeing how stagnant real compensation has been. The main benefit is healthcare, and that is not monetary compensation but compensation in kind. It may have a monetary cost to the employer, but that is not what the employee receives. If 10 years ago, an employee received $2000 a month and a Thanksgiving turkey that cost the employer $25 (and that cannot be resold by the employee so it has no market value to the employee), the employee’s compensation was $24,000 and a turkey, not $24,025. If today wages have only gone up to $2200 a month but the turkey now has the grossly inflated cost to the employer of $100, from the employee’s standpoint he or she receives $26,400 plus a turkey, not $26,500. There is no justification for using the cost to the employer of a benefit provided for the purpose of assessing the value to the employee of changes in the employee’s compensation when the benefit is the same thing received at the previous time. In the case of insurance, the employee receives insurance to pay for medical care. That was basically the same thing received five, 10, 20 or 40 years ago — and if anything, it is less valuable than it was because the deductibles employees pay most likely have increased faster than general inflation. When you are trying to make the case of how employees “should” feel about whether increases in compensation are fair or have kept up with inflation, the cost to the employer of the insurance is irrelevant. Instead, the increase in deductible — to the extent it is higher than the general inflation rate — should be offset against wage changes to get a truer measure of how well off the employee is likely to feel.